In case you missed it, I could have placed 1000 pounds of explosives on each floor level of the WTC Towers and detonate them all at once and the results would have been blown out walls and windows, but the steel structure would have remained intact. I may have said this before, but I am fascinated in learning your interpretation of the Oklahoma City Bombing. You can't properly pre-weaken the steel structure of a building or rig explosives in an occupied building in secret because of the intense noise generated and hazardous conditions that would result. What's wrong with pre-weakining? Wasn't there some fire alarm in WTC 7 that was turned off at different intervals, allowing someone to work in the elevator shafts with a torch? The foam looks exactly the same as the stray-applied fireproofing material. What are you literally even? It doesn't make any difference. The sound of explosions would have been detected. you don't seem to understand that if you don't properly pre-weaken a steel structure before placing explosives, you can detonate the explosives and the steel structure will simply redistribute structural loads and remained standing. Structural pre-weakening is a long process and in fact, it took months of preparation just to bring down a steel bridge in Corpus Christi, Texas and that was nothing compared to what it would have taken to properly pre-weaken the steel structure of just one of the WTC Tower. There is no photographic evidence for fires in the building until 12:10 PM. There were uncontrolled fires raging within WTC 1, WTC 2, and WTC 7 and it was all captured on video before they collapsed. Let that be a marking point for when any serious fires could have developed. The building fell according to that engineer's prediction somewhere around 11:30 AM. Buckling of the WTC buildings observed before they collapsed was indicative of structural failures due to uncontrolled fires. Far from all of the WTC7 core columns were in lift shafts. And of those that were not all the faces of the columns were accessible - walls that abutted occupied space would have needed stripping down to get to the columns. I'd have thought you'd be aware of this, but it seems you've relied on "saying any old stuff" by way of research. That building did not fullly collapse. The wall of the building received the effects of blast wave, which was devastating. That same blast wave would flow around steel columns. Have you ever seen a video of a steel frame building withstanding the blast wave of a nuclear bomb? There were no walls or windows, but the steel structure remained standing. It is a requirement in order to bring down a steel frame building, otherwise, the steel structure will simply redistributed structural loads as was the case when the WTC Towers were struck by those aircraft and when debris struck the south wall of WTC 7. Wasn't there some fire alarm in WTC 7 that was turned off at different intervals, allowing someone to work in the elevator shafts with a torch? Structural pre-weakening is a process that would have taken many months and would not have been tolaterated in a crowded building, especially with all of the dust, fumes and high noise levels that would have been generated during that operation. Last edited by skyeagle409; 22nd August 2016 at 12:23 AM. That too. CTists have watched too many 'Mission Impossible' variants where experts nip in and do months of work in 30 minutes. Szamboti's demolition crew being a prime example. I think you need to educate yourself on exactly how this pre-weakening is done. I see. So you are going to create a fairly detailed description of what was done at the three of seven WTC buildings you have concerns about. This apparently will include installation of some number of explosive sets with foam and sheet metal sound dampening. When might this description be completed? Before or after the turn of this decade? Do you have reason to think that such a retrofit couldn't last the turn of the decade?. You apparently did not read my post with comprehension. It would outline the operation of said installations. How many installation teams, when such work would be done (keeping in mind the estimate of installation time). It would include the cover story used to explain those installations that are in public view, or those that will be seen by maintenance personnel over the course of time between start of installation operation, and Sept 11/01. If YOU aren't doing this report then I suppose AE911T will doing it. It should be obvious that no one should hold their breath waiting for JAQ'ers like you to EVER actually DO something. 9 storey building, 6500 pounds of explosives, directed charge, the front of the building was destroyed, some floors collapsed, the vertical supports remained. What is your interpretation of the OKC bombing? ETA: and btw it was LOUD and also took out windows in other structures for miles around. The blast destroyed or damaged 324 buildings within a 16-block radius, and shattered glass in 258 nearby buildings. The broken glass alone accounted for 5% of the death total and 69% of the injuries outside the Murrah Federal Building. 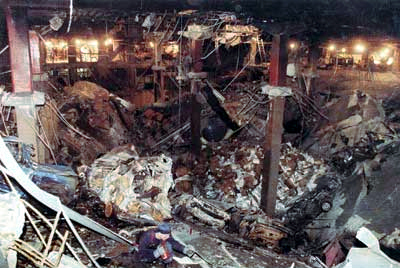 The blast destroyed or burned 86 cars around the site. The destruction of the buildings left several hundred people homeless and shut down a number of offices in downtown Oklahoma City. The explosion was estimated to have caused at least $652 million worth of damage. Last edited by jaydeehess; 22nd August 2016 at 06:44 AM. The foam looks exactly the same as the stray-applied fireproofing material. It would break apart very easily, liberating most of the sound. That's why the tin is there. The foam needs something to compress against. The blast energy must turn into something (heat from compression, in this case) in order to be dissipated. There is no photographic evidence for fires in the building until 12:10 PM. Let that be a marking point for when any serious fires could have developed. That's Pentagon no-planer logic. I can't see it therefore it didn't happen. Never mind the testimony of engineer Mike Catalano, who reported a generator catching fire when WTC2 collapsed. Now, here is how it's done. The first step in preparation, which often begins before the blasters have actually surveyed the site, is to clear any debris out of the building. Next, construction crews, or, more accurately, destruction crews, begin taking out non-load-bearing walls within the building. This makes for a cleaner break at each floor: If these walls were left intact, they would stiffen the building, hindering its collapse. Destruction crews may also weaken the supporting columns with sledge hammers or steel-cutters, so that they give way more easily. Demolishing steel columns is a bit more difficult, as the dense material is much stronger. For buildings with a steel support structure, blasters typically use the specialized explosive material cyclotrimethylenetrinitramine, called RDX for short. RDX-based explosive compounds expand at a very high rate of speed, up to 27,000 feet per second (8,230 meters per second). Instead of disintegrating the entire column, the concentrated, high-velocity pressure slices right through the steel, splitting it in half. Additionally, blasters may ignite dynamite on one side of the column to push it over in a particular direction. Notice in following photo how CD explosives that are firmly attached to structural columns are wrapped with a fabric covering. What you see in the photo was not found in the rubble of the WTC buildings. Here is what happens when the demolition preparation process is not done properly. You can't just pack a steel frame building with explosives and expect the building to collapse without doing the properly preparations beforehand, which would have taken about a year for each of the WTC buildings if not longer, otherwise you will get something like this in case you missed it when I posted this photo before. Last edited by skyeagle409; 22nd August 2016 at 07:36 AM. It seems that people such as MJ have this idea that a smoldering fire would be detected when FFs searched WTC 7 earlier in the day. One wonders at the cognitive dissonance that it takes to believe that. When FFs went through WTC 7 it was filled with dust, there were fires in the rubble of the towers and several other buildings in the WTC area were on fire making all of Manhattan smell of dust and smoke. FFs did in fact find some small fires burning, again contributing to the undetectability of any smoldering fires. but did not engage them. Because the building was determined to be unstable and because the FDNY had lost hundreds of men already, and because water supply was an issue and because there was no one left in WTC 7 and because personnel were concentrating on search and rescue, WTC 7 was left alone. Therefore fires grew and spread. That necessarily meant that continuing structural damage would ensue. WHAt is it that makes this so difficult for MJ et al to comprehend? The mind reels at the idiocy. Wrap it in duck tape? I don't know, man. I already showed that the basic outline for relatively simple noise abatement technology does exist. Do you happen to know how loud the actual collapses were, by decibel and distance? Not doubting Catalano, but on a side note could you fill me on on how that is actually possible? It wasn't used during the 9/11 attack. Do you know why? No evidence on audio, seismic data or found within the rubble of the WTC buldings. I might add that there were no secondary explosions when the aircraft struck and no secondary explosions observed after debris punched a huge hole on WTC 7 and no secondary explosions observed within WTC 7 depite the building burning for hours. Last edited by skyeagle409; 22nd August 2016 at 09:14 AM. YOU are the one pushing a noise abatement to mask the sound of explosives. It's YOUR burden to research and come up with a coherent description of such a thing in this specific case of the towers and WTC 7. If not you then SOMEONE who is trying to tell the world at large that explosives were used has the burden of proof to AT LEAST come up with such a coherent description, a report, on how it was done. Can you not see that this is required before the idea of explosives use is anything other than imaginative fiction? How is it possible for a generator to catch fire? ANY electrical equipment can catch fire and that goes just as well for devices that USE power as it does for devices that PRODUCE power. In August of 1997 the hydroelectric station powerhouse at Ear Falls, Ontario, Canada, burned down. The dam and dam controls were undamaged and the powers station rebuilt. I spoke with a resident who said that late at night a huge squealing sound came from the dam that was audible everywhere in the small town. Shortly afterwards it was seen that the unmanned power station building was on fire. There are videos on the internet of power transformers on fire. What is your issue with this? MJ's estimate there were 1000+ explosives planted. Thus there were 2000+ explosively severed pieces of structural components (sever a solid item and two pieces now show evidence of being explosively severed). Yet there is NO evidence of ANY such explosively severed structural components. Well, now show that it was actually used and you might have something. You are trying "A exists, B exists, therefore A was caused by B" (where A = absence of noise; B = technology for noise suppression). That's ridiculously flawed logic. I'm sure you can realize that. Last edited by pgimeno; 22nd August 2016 at 09:47 AM. Highlighted is the relevant point. 911TM says that explosives were planted TO DEFINITIVELY CAUSE total collapse of three buildings. That requires planning and engineering of an explosive placement and sequence. Simply loading up with explosives will not ensure such a supposedly necessary total collapse. That type of operation did not work in the WTC 1 in the bombing , nor did it cause total collapse of the 9 storey Murrah building on Ok City, nor did it do so in the Serbian(or was it Croatian) Chinese Embassy building. Sure, such a thing might work if the explosive power is sufficiently huge (shades of mini-nukes) but that also then negates any talk of noise abatement, as well as negating the supposed requirement of total collapse and undetectable explosive use. If drywall panels had to be removed to access the bare columns, then what's wrong with that being done during the heavy renovations of 1998/1999? If the upper 60 stories of a tower were rigged (because there's no chance of a plane flying lower than that), I'd estimate that would take 400 charges per twin tower if they're only placed on the outer core columns. Same math depending on how long the WTC 7 columns were, rigging all columns through the span of 8 floors. Devices placed on the perimeter, who knows? I already gave photographic evidence for the perimeter being dismembered artificially. Someone asked for evidence of explosive destruction, I gave it, and they moved the goalpost with their coked out "silent explosives" meme. Imagine if this wasn't the World Trade Center, this was john's skyscraper down the street that burned down, no casualties or political pressure; Mr. Arson Investigator watches a video and sees how the perimeter of the building appears to be dismembering in mid-air after a flash of light and puff of smoke. What is that observation consistent with? foam? foam?! FOAM?! FOAM?! WHERE WERE THE 50 TON HYDRAULIC PRESSES MAN. Why can't you answer simple questions? Try reading the above again and this time answer the questions. The top 60 stories in WTC 1 and 2, along with 8 stories in WTC were "heavily renovated" in 1998/1998? Do you have proof of this? Who did this work? Because cutter charges have a significant thickness. You can't have short sections of drywall sticking out with charges underneath, as it would look stupid and people would be asking questions, and loudly. You'd have to re-clad the whole height of it. And where the column was at the end of the central elevator block you'd have to extend *all* the drywall outwards for the entire length and width of the block to avoid the same problem. It's a ludicrous idea. Then you'd need to demonstrate that these 'renovations' covered the entirety of the floors supposedly blown-up. Does it ever occur to you that you're so devoted to believing this CT guff that you'll grasp at absolutely anything - however absurd - to defend your belief? So?> Your inside job remains a fantasy; 15 years of failure. You remain 8 years behind, and clueless on what happened on 9/11, and how the tower collapsed due to fire. Last edited by beachnut; 22nd August 2016 at 10:35 AM. Did you even read what you linked to? Hint it doesn't mention anything about 60 floors or renovations on entire floors. Who performed this work by the way? Even more basically, there was NO evidence pre-weakening was done, so it is a call to magic. ETA: And it is a red herring in the thread. Last edited by LSSBB; 22nd August 2016 at 10:44 AM. And you have no evidence this noise abatement was installed, so it is a call to magic, and also it has nothing to do with this thread. Masterful derail you've got going, good luck with stretching it out and keeping the hope alive, especially when the demolitions theory really has no hope. when it's obviously the result of cutting torches. I'm sure you can do better. Go ahead. Riddle me this: if bright flashes are explosives AND the sound of explosives is dampened by foam and sheet metal, then how in the hell do we see bright flashes AND not hear them? What about THE (afaik only one is ever mentioned) 50 ton press? Its a chunk of metal weighing in at about 500 pounds. What about it? Last edited by jaydeehess; 22nd August 2016 at 10:59 AM. Didn't you stop to think about security personnel, building inspectors, and janitorial employees, not to mention the thousands of workers inside those buildings, who would have noticed the thousands of feet of detonation wires and explosive hardware and required equipment needed to demolish steel frame buildings with explosives? Now, think about all of the waste material created during the preparation process. Last edited by skyeagle409; 22nd August 2016 at 11:24 AM. Let's hear it from a demolition expert. Part of me wants too google that, but the better part of me knows it'll just link to crackpot websites. Here MichJava, this is what a 50 ton press looks like before it gets crushed by a million tons of office building materials. On a similar note, I own a 10 ton, and a 20 ton, hydraulic bottle jack. I can easily lift them. Could, if I had reason to, lift one with each hand, off the bench. Might be hard pressed to do arm curls with them though. Last edited by jaydeehess; 22nd August 2016 at 12:24 PM. Here's an article from (the obviously NWO controlled ) Fire Engineering magazine. You're making it look like a 50 ton press does not actually weigh 50 tons. Every truther knows that you're lying. You understand that a 50 ton press does not weigh 50 tons right? What is so difficult about these questions? Last edited by jaydeehess; 22nd August 2016 at 02:02 PM. testing testing,,,, is this thing on ,,, IS THIS THING ON? I note that there would have been several types of items that could have survived relatively intact through the collapses, whereas a hydraulic press in a machine shop is NOT one of those things. Air conditioning condenser cores, elevator motors, large transformer coils/cores. I do not find it at all odd that there are no references to finding such items in the rubble. It's just NOT important in the least to warrant mention. How much does a 50-ton press weigh?